The ad network API helps advertisers measure the success of an ad campaign while maintaining user privacy. Apps can participate by displaying ads that ad networks serve, or by being advertised. 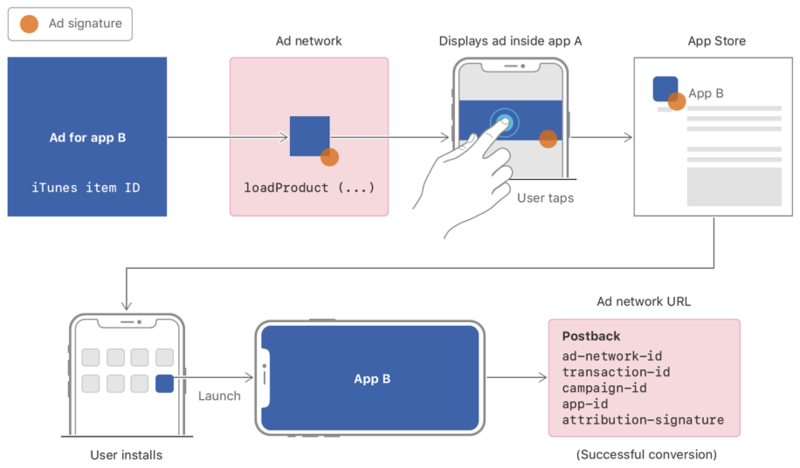 When a user taps an ad, advertisers display an App Store product screen with signed parameters that identify the ad campaign. If a user installs and opens an app, Apple sends to the ad network a conversion notification for that campaign. The conversion notification is signed by Apple and does not include user- or device-specific data. Initiate install validation by displaying an ad with signed parameters. The keys for validating and associating an app installation with an ad campaign.